Alison Buckler is a researcher for the TESSA (Teacher Education in Sub-Saharan Africa) Programme based at the Open University, UK. She is also writing up her PhD which is applying a capability framework to a study of teachers' roles in rural schools in Sub-Saharan Africa. Associate Professor of Science Education in Egerton University, Kenya. He has been involved in Teacher Education for 28 years. Currently he heads the Department of Instructional Materials Development in the College of Open and Distance Education, Egerton University. He is also the coordinator of the TESSA project in Egerton University and was awarded an OLnet fellowship of the Open University in the 2010/2011 academic year. Over a period of three years a number of International and African based institutions collaborated to design and create a set of Open Educational Resources (OERs) to support school based teacher education as part of the TESSA project. Writing of the materials drew on case studies, experiences and existing resources from across the region using a highly structured template. These TESSA OERs were then adapted to be appropriate for each user setting and practices. It is this process - supporting the user community to harness and integrate OERs for their own systems and cultures, which is the focus of this article. The authors draw on a range of data to make explicit the kinds of knowledge, skills and support employed in the adaptation process and in particular the role of the structured template in supporting this process, and the problems encountered. The article suggests that OERs will only fulfil their promise if more attention is accorded to issues of user access and skills as well as the form of the OERs, their purpose and underlying pedagogy. Finally the paper offers suggestions for guidance to support other users in adapting OERs for their own context whilst maintaining the quality of the OERs and working towards self-sustaining communities of users. The internet makes possible the creation and sharing of a global intellectual resource of teaching and learning materials. Most recently the philosophy and development of Open Educational Resources (OERs) together with the rapid expansion of connectivity, particularly in areas such as East Africa, is beginning to offer unencumbered universal access to digital learning resources and the promise of improved educational opportunities in diverse, geographically dispersed educational communities (Atkins et al, 2007). The facility to amend and modify OERs makes viable the production of educational materials relevant to the cultural context and heritage of each locality; OERs have potential to celebrate diversity and to embrace the voice of the 'local' in resources to support learning without the creation of new original materials in each learning situation, giving access to high quality materials to those working in poorly resourced environments (OCLOS, 2007). Through sharing of the OERs together with associated adaptations and reflections on their use there is the potential for constant improvement of the materials, the 'virtuous learning loop' (Atkins et al, 2007). There is much eloquent advocacy for OERs and considerable funding has been devoted to their production (Casserly & Smith, 2008). But this is only the first stage in the cycle; users have to locate suitable OERs, adapt for their own social settings and practices, use the OERs and then make the adaptations available (perhaps with commentary on the form and impact of their use) to a wider community; otherwise the resources remain just another piece of 'content', merely stuff rather than a tool (Cantoni, 2008, quoted in Conole & Weller, 2008: page 11). To date there are few detailed accounts of user interaction with OER - how teachers and students approach, change or adapt OERs for their own contexts, in particular in contexts with few other resources (Harley 2008). What forms does this adaptation process take and what might be the factors that support or constrain it? To what extent is the form of original OERs influential in allowing users to legitimate their own local knowledge in adapted OERs? Our interest is in teacher education and the use of OERs to support teacher educators in sharing their intellectual capacity, particularly in a resource challenged environment such as Sub Saharan Africa. Here, access to high quality, pedagogically sound learning materials is frequently inhibited by the inability of African educational institutions to afford them. Consequently, learning materials are scarce at all levels of the system. Thus the potential for OERs to contribute to the support, education and training of teachers is considerable, as are the challenges. Locating appropriate OERs is a time-consuming challenge for everyone; the pedagogic approach inherent in the OERs is often not explicit and neither is the context of their creation. However for those colleagues working in Africa, the challenges are magnified: the vast majority of OERs available online have not been created within African contexts. In higher education, the leading arena for OER activity, OER production has been dominated by a few elite institutions in the US and Western Europe. OERs from these sources do not transfer easily to low income countries (Kanu, 2005) and major adaptation is often required to ground them in the cultural realities of the environment of their use. But even for those OERs generated within the continent, we suggest that adaptation is needed to ensure that the learning materials support authentic pedagogy, supporting a teacher's understanding of a concept and situating their practice in their own specific context (Leach & Moon, 2008). In this article we report on the highly structured and supported process of adaptation of TESSA OERs for nine country settings across Sub Saharan Africa. 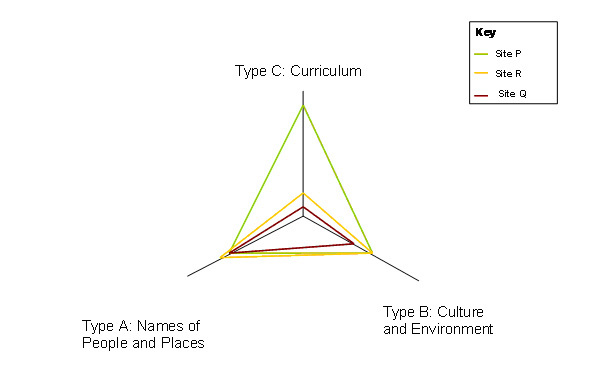 Data from analysis of the outputs of the process in three of these sites, along with exploration of the understandings, attitudes and prior knowledge of those professionals who undertook the adaptations, are used to suggest a number of factors which appear to have influenced the adaptation of the TESSA OERs. We conclude by reflecting on the implications of these factors for the design of OER for cross-cultural use. Teacher Education in Sub Saharan Africa (TESSA) is a demand-led research and development project providing a practical and scalable response to the huge need for more qualified and skilled teachers in Sub Saharan Africa (Moon, 2007; Wolfenden, 2008). To meet the targets of the Education for All initiative and Millennium Development Goals for education (UNESCO, 2010) an estimated 1.2 million new teachers are needed in this region, in addition to training for existing teachers, many of whom have had little access to either pre-service or in-service provision (Lewin and Stuart, 2003). TESSA is characterised by a focus on school-based teacher development - supporting teachers to interrogate and expand their repertoire of practice, shifting the dominant frame of learning within their classroom. Well-trained teachers, it is argued, will raise levels of pupil achievement (Dembélé & Lefoke, 2007; Commission for Africa, 2005) which is currently low in many countries across Sub Saharan Africa (UNESCO 2005; 2007; 2010). Core TESSA activity is the collaborative creation and sharing of OERs and the development of strategies to support their use. Some teacher education institutions in Sub Saharan Africa are in a position to commission or produce materials themselves but many are not. Conditions for teaching and learning in colleges of education (the main providers of primary teacher training) are very frequently inadequate, reflecting the school systems they serve. Physical infrastructure is often in a poor condition and insufficient for the number of students, with limited access to textbooks and libraries. Commonly teachers have few or no materials to support the 'practicum' element of their training programme and little or no guidance on linking ideas of learning, encountered in college lectures, into classroom settings with pupils - articulation between theory and practice is frequently weak with a low emphasis on developing skills of analysis and reflection (Adekola, 2007; Lewin, 1999). Drawing on the ideas of Bruner (1996) TESSA OERs are conceptualised as a professional learning and strategy toolkit; this includes a large bank of highly structured original OER study units to support school-based teacher learning. Teacher educators and teachers select from the bank according to the demands of their different settings. The materials are directly linked to the pupil curriculum, allowing teachers to develop their skills within their usual professional practice (Wolfenden, 2008). The TESSA website (www.tessafrica.net) provides a platform for sharing the TESSA OERs in a variety of formats (web pages, pdfs and word documents) and for sharing of further adaptations and community dialogue. However the majority of teachers engaging with TESSA OERs, currently access the materials in print form although increasingly we are seeing use of TESSA OER through CDs and online. For teachers access is usually, but not exclusively, through registered formal study on a range of programmes and courses at TESSA consortium institutions (Thakrar et al, 2009). There is no unique TESSA course or accreditation; TESSA harnesses existing accreditation systems but TESSA OER use is undoubtedly influencing the development of assessment regimes in institutions within the network. We are seeing a shift from examination driven systems to assessment design which includes assessment and examination of teaching in authentic situations featuring direct engagement with pupils - portfolios assembling artefacts of practice such as lesson plans, pupil work and recording of classroom episodes. A major driver for this change is concern over standards of pupil achievement. Use of such assessment tools, it is hoped, will serve to foreground teachers' attention on examining their teaching in relation to pupil learning. Activities within the TESSA OERs provide useful and relevant structured opportunities for assessing the core skills of teaching and teachers' direct enactment in practice of theoretical understandings rather than the use of proxies. This use of TESSA OERs is supporting greater integration of theory and practice within programmes. The TESSA consortium comprises eighteen institutions; 13 of these institutions are directly engaged in delivering teacher education in nine countries of Sub Saharan Africa. TESSA is led by the Open University, UK and supported by grants from a range of philanthropic trusts and government funds. TESSA OERs were designed and created collaboratively by teams of academics from across Sub Saharan Africa through numerous workshops at locations across the region and virtual working. Three characteristics of this process are of interest. Firstly there was a very clear target audience for the TESSA OERs - teachers working in challenging circumstances in basic education across the region. Secondly, drawing on previous work at scale (Hutchinson & Wolfenden, 2006), the team proposed a template approach to the development of the TESSA OERs. Thus the OERs were conceptualised as 75 study units, each written in the same highly structured template. The TESSA curriculum comprises fifteen study units in each of five areas of the primary curriculum; literacy, numeracy, science, life skills and arts and social science. Each study unit aims to develop particular aspects of teachers' classroom practice and was subjected to a rigorous quality assurance process. 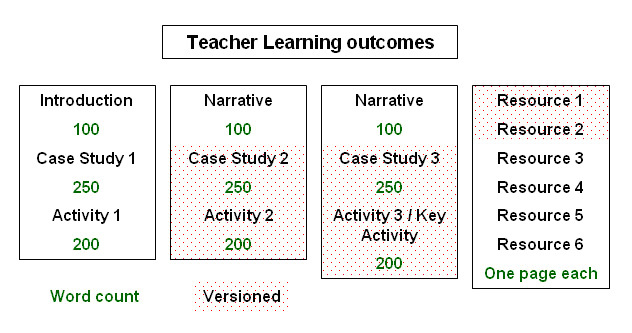 Thirdly, it was recognised early on in the process of developing the OER study units that different versions would be required for each setting (defined at country level) - adaptation would be needed to ensure that representation of ideas was meaningful to the teacher's context or situation (Lave & Wenger, 1991). Thus adaptation of the original 75 units for each of the nine country contexts was part of the formal process of development of the TESSA OERs. These parameters informed the design of the TESSA OER study unit template. Teams of authors for each curriculum area were established; each team included authors from several different countries represented in the TESSA consortium. The authors were all experienced teacher educators who drew on their own personal experiences of working with teachers in such environments - their own cultural scripts, on findings from research studies such as the Teachers' Lives project undertaken as part of TESSA (Buckler 2009; 2011), case studies and existing resources from across the region. Each component of this template has a very clear word limit as shown in figure 1. TESSA aimed to create learning materials that could be shared and easily re-used in a variety of contexts, reflecting local contexts, needs and cultures without complete reworking. Adaptation of the study units was to ensure that the materials spoke to experiences of teachers in a particular context whilst retaining the integrity and internal consistency of the OER. Recognising a range of resource and capacity constraints in the adaptation process we precluded changes to each aspect of the template - too costly, time consuming and with the potential to change the focus of the original units. Rather, initial drafts of the study units were analysed together with feedback from first stage development testing at a variety of sites. The group enjoyed robust discussion of the ideal balance of cross-cultural and country specific representations within a study unit. Finally a collective decision was made to restrict adaptation to 40% of each original study unit. Changes, or adaptations, would be made to particular aspects of the study unit template; the second and third activities and case studies and any two of the six supporting resources. Certain aspects of the template such as the learning outcomes, and the first activity and case study were generic and to remain unchanged across all versions. Thus we hoped to preserve the integrity of the units as a learning episode, to prevent adaptation leading to integration of additional material and to constrain costs. This decision shaped both the writing of the original study units as well as their adaptation. Areas of the template not open for adaptation were written to be appropriate across all cultural settings and environments; terms specific to one locality were avoided and across each module (five study units) a balance of examples from across Sub-Saharan Africa was included. Parts of the study unit to be adapted (shaded in figure 1) drew on examples and perspectives of the unit author's own context. By considering these characteristics those responsible for adapting the materials could make changes which reflected local conditions and were grounded in the cultural realities of the teacher-learners. But the use of examples from across the region in the un-adapted part of the study unit (60%) ensured that the teacher-learners were not restricted to examples from their own culture and immediate environment. The process was tailored for each country with some key characteristics shared across the consortium. TESSA institution coordinators were responsible for the recruitment of staff to undertake the adaptation process, often drawing from the pool of original TESSA authors or critical readers. A minimum of two lecturers for each subject area was suggested. How did you become involved with the TESSA materials? Why do you think you were asked to be involved? What did you think the purpose of the TESSA materials was? How do the TESSA materials differ from the materials your institution generally uses in teacher education courses? How was the role of adapting these OERs explained to you? Did you undertake any research during the process? Can you give me an example of something you altered? An interview was also conducted with the TESSA curriculum director who held responsibility for the adaptation process across the consortium. In each site the process tended to start with a 2-3 day workshop, usually co-led by the TESSA Curriculum Director in collaboration with the TESSA institution coordinator. Some workshops were attended by two or more institutions. A generic TESSA handbook was given to all workshop participants to support them with the process. Depending on the number of staff involved, support required and the extent of changes, the first draft of adapted material was completed either during the workshop or shortly following the workshops. At each site the TESSA institution coordinator provided support to their colleagues undertaking the process. External critical readers were recruited to comment on the final draft. Key deadlines for the final draft of the adapted materials were standardised across the consortium, although intermediate deadlines were negotiated as necessary for each institution. Link coordinators were recruited to liaise between the Open University, UK, the institution coordinators and the critical readers to facilitate submission and feedback. Adaptation of TESSA OERs at the three study sites followed this general pattern, although at site P the lecturers (subject specialists) worked individually on allocated sections after an initial group meeting, whilst at sites Q and R lecturers worked for the whole process in teams (of between two and five colleagues) on particular subject areas. Team size was primarily a function of resource allocation and geographical spread of the lecturers' base campus. To understand the number, nature and form of the adaptations made to the TESSA OER we mapped changes in a sample of materials from the three sites against the original study units. Our sample included one study unit from each module - 15 study units from each site - this represented 20% of the complete materials. Two sets of the sample materials were in English. For the third set the mapping was carried out in the language of the materials and then the changes noted were translated into English for our analysis. We generated maps of the adaptations and from our analysis of these we propose an initial typology of changes to the TESSA OERs. Make a straightforward change of the name of a person or place to one that is locally relevant. These changes require local knowledge but little or no research, rather this type of change draws on knowledge of the participants' own communities; several lecturers commented on the need to ensure that their choices of names reflected in-country diversity. Make more complex changes including the replacement of traditional stories or historical events with culturally relevant examples, or the replacement of geographical landmarks or organisations with local examples. These changes drew on lecturers' existing local knowledge but also involved use of tools to undertake further research. Changes to more fully align the materials with the existing National Curriculum for primary pupils taking into account relevant required skills, prior learning experiences of pupils, preparation for specific assessments and country specific terminology and conditions. These changes often included the addition of extra resources or the omission of particular resources which were felt not to be relevant to the specific curriculum or country context. This type of change also included adaptation of the materials to reflect different learning levels of pupils. Pupils are asked to write a story about their duties and present it to the class. A vote is then suggested to discover the most popular and most unpopular duties. Additional resource added. We have represented this typology diagrammatically in figure 3. The length along each (2-dimensional) axis is directly proportional to the number of changes of that type for each site. Unsurprisingly Type A changes predominate across the sample; Type B and C changes are more complex, reflecting prioritisation of ideas, choice of knowledge and privileging of perspectives in the culture and, with the exception of site P, were fewer. The surprising difference in the number of Type C changes we suggest is a result of the different interplay between subject matter, methods and pupil expectations in different cultures. The may have been a result of the higher levels of confidence in making changes at this site (P) or a reflection of the appropriateness of the original materials for that context. Our typology is of adaptations noted in the TESSA process and is not intended to be exclusive or of relevance to other adaptation processes. Overall the number of changes noted is small and we suggest several factors that may have worked to limit the number of changes: lecturers' lack of prior knowledge of the materials and familiarity with OERs, their ICT skills and access to ICT tools, the highly structured nature of the template and the forms or modes of working. Coordinators of the adaptation process noted that the lecturers tended to be 'confident', 'outward-looking', 'sure of themselves and aware of the injustices in education in their countries' (TESSA curriculum director). However, despite this confidence and unanimous open-mindedness towards OERs that participants expressed in the interviews, the actual process was a challenge for many. Several of the lecturers involved in adaptation of the TESSA OERs had been involved in the original authoring but none of the lecturers had encountered OERs outside the TESSA project and none had been previously involved in the process of changing or modifying the work of academic colleagues for publishing in a public space. Adapting the work of academic colleagues proved to be a steep practical and cultural learning curve. For many lecturers making changes felt disrespectful to the original author and implied a criticism of the author's work. This was a form of workplace literacy with which they were deeply unfamiliar and, at least initially, uncomfortable. It appeared to be in competition with the dominant literacy practices in education domain where activities such as sharing, copying and collaborating are tightly controlled and policed - the practice of plagiarism often being punished. The forms of discourse of OER adaptation, including formulas for action and any specialised vocabulary of this new practice, were all evolving through the practice - practice with unresolved boundaries and a high degree of fluidity. Lecturers claimed teamwork supported them in improving their understanding of the adaptation process, although it did not necessarily lead to a larger number of changes or adaptations. Although those changes that were made were more likely to draw from different cultures and practices within the national context. Across the three sites we noted different levels of computer use and digital working. At site R the entire process was undertaken on soft copies and ongoing support for the lecturers, following the initial workshop, was by email. At site Q initial changes were made on hard copy materials and later transferred to soft copies. Continuing support was through face-to-face meetings. At site P the entire process was undertaken without the use of electronic tools. Changes were made on hard copies and the lecturers travelled, often long distances, to meet with the TESSA institution coordinator to discuss progress. 'And also, there is the fright. I will admit that most of us at this age on this campus are not computer literate and when someone says use this! Use this computer, there is a fright! They panic! We have professors who cannot even use the computer. Most of us are not sensitised to the use of the computer […] and the facilities are so few. So because of that, using this computer for TESSA has been a small problem!' (Lecturer, Site Q). We think it interesting to note that OERs are frequently linked closely with the use of technologies but we see here that these computer based practices are closely linked to and drawing on print based practices. TESSA experience at site P - where adaptation was carried out by hand, on hard copies of the materials, suggests OERs have equal applicability in contexts where access to computer technology is sparse. 'I also teach those distance students so I am aware of their environments, I have written a book for them in fact' (Lecturer, Site R). 'So the purpose is to teach teachers to teach the children to be critical thinkers. Life would be a little better if it was not just about certificates' (Lecturer, Site R ). While the original TESSA authors were selected through a rigorous, cross-consortium interview process, participants for the adaptation process were chosen locally by each institution. Interestingly the drop-out rate was much lower for adaptation than for authoring. We suggest that this may be because institutions were more able to accurately interpret the suitability of each prospective participant's personal construct to the task and compatibility with the ethos of TESSA and the wider OER movement. 'For example, I look at the materials now, even though they are versioned and I still see things that I might change for some teachers, because they are not the same and their needs are different to each other. I would like to re-write some case studies again, and also some of the internet pictures are not rich, I would like to change them' (Lecturer, Site P). The template for the study units was felt to bring numerous advantages. It removed the pitfall, noted in other projects, that adapting leads to suggestions for additional content rather than the replacing of existing content with locally specific material. The template minimised the chance of repetition of content. Equally importantly it provided structure and transferability. The template ensured the consistency and coherence of the materials - both as independent study units and as part of the broader module and subject area - was preserved. Finally the template reduced the need to spend resources on design and layout. These funds could be directed towards new illustrations, critical reading and editing. On the other hand the template may have restricted the lecturers' perceived freedom to make significant changes to the materials. In the interviews, lecturers suggested that while they saw the task as creative, they did not feel it was a major undertaking. In a subsequent TESSA project, developing materials for secondary science teachers, we have adopted a variation on the authoring and adaptation process. Firstly authoring of the generic or original OER (to the same template) has been undertaken collaboratively in workshops with a number of lecturers from each of the five participating institutions. The generic materials thus contain case studies etc from across these cultural contexts. Secondly the group undertaking adaptation at each site includes these original authors, giving a higher collective level of prior awareness of the OER and the function of the template. Lastly the sections of the template which are to remain unchanged have been much more loosely defined, only the learning outcomes and introductory narrative have been agreed must remain intact, lecturers have freedom to choose which sections to adapt up to a total of 40% - a balance of preserving the integrity of the resource and financial constraints. We hope this modification of the process will support lecturers in viewing the OER more holistically, so they ask, for example, 'how can this resource best support my view of good teaching? What changes need to be undertaken for it to do this?' rather than focussing attention immediately on relatively low level changes, such as names. At the time of writing this process is underway and we are attempting to capture the views and experiences of the participants. 'In every session we tried to compare notes to see who is doing what and how different it is from what I am dong. So yeah it was […] the group sharing the challenges and strengths' (Lecturer, Site R). The workshops also inspired competitiveness between the different curriculum groups and the use of examples drawn from across their country context. Type C changes demand up-to-date knowledge of the curriculum and type B amends require knowledge of both the immediate local context and that from across the country. Working in groups helped to facilitate this broader inclusion of knowledge. In the sites analysed, access to virtual workspaces was highly constrained and it was only truly in the face-to-face workshops that lecturers had space for collective negotiation of changes to the OERs; in other environments with ready access to the web such interaction might be supported in a Wikipedia type process. A challenge for the TESSA community, without extensive and easy online access, is the continuation of this adaptation process and recording of TESSA experiences, without the funding to give these types of opportunities and easy access to a wide range of sources of information. All lecturers involved in versioning drew on numerous sources of knowledge - in the absence of easy reliable internet access or high level 'searching skills', many relied on print libraries. Interestingly no lecturers used local teachers themselves as sources of support for the versioning; they drew on their own teaching experiences but didn't visit schools for the explicit purpose of gathering more local material (e.g. examples of pupils' work from that region). Quite possibly they didn't see this within the remit of the task, or they felt that they were expected to use their own expertise, or perhaps quite simply time was too limited. Cross cultural working inevitably holds many challenges; the main source of tension in this process was deadlines - different perceptions of their meaning and importance between the Open University, UK and the TESSA partner institutions. Often these deadlines were tied to funding milestones and determined by administrators outside the immediate TESSA team. What was perceived to be realistic from the perspective of a British university was often not possible when means of communications were unreliable, where ICT competence and confidence were low and where internet access was sporadic. 'Really it was to keep a finger on the pulse, it was to keep gently prodding in the nicest possible way. Of course the OU is run by deadlines and TESSA is no different. So that the OU deadlines set for TESSA sometimes weren't realistic, but nevertheless they were important because they drove it on, otherwise we might never have finished. So although we used to moan about them it was absolutely right that we had them. We were forever adjusting them but that's what deadlines were about. They gave us leverage to actually say look we need the work' (TESSA Curriculum Director). Making content (OER) available to others is relatively easy; ensuring that it is useful is much more difficult but cultural appropriateness and task authenticity are essential to support learning. In TESSA we devoted considerable resource to adapting the 75 generic study units for a number of sites of use. The process involved a dozen workshops and occupied almost a year. In the field of OERs we were unable to locate any prior examples of this process at scale to use as a model for the process. Analysis of the 'products' - the different versions of TESSA OER - revealed that the overall number of changes or adaptations was modest. So was this process worthwhile? We suggest that the investment in the process was hugely valuable; its value lay in the process, the shared experiences of the participants rather than the material outputs but that there is much scope to develop the process and our understanding of how participants can be encouraged to be bolder in adapting the OER to ensure they are truly culturally embedded. Adaptation of the OERs, as described here, paid attention to the lecturers' own 'experienced worlds' as they came into contact with new models and engaged in new practices - the critique, modification and use of the OER. Developing these practices can be described as the formation of a community of practice; merely one of the several communities in which each lecturer participates (Wenger, 1998). Through the TESSA workshops, lecturers engaged in a joint enterprise with a shared repertoire; this shaped their learning of the nature of OER and fostered ownership of the OER (SAIDE, 2009) - a blurring of the division between content producer and content user (Downes, 2007). For many of the lecturers access to this community in the TESSA OER process, even though their subsequent participation may have been limited or peripheral, has been sufficiently significant to contribute to their identity; negotiation of local forms of the practices within a wider African context have been particularly important - the interplay of 'the local and the global' (Wenger, 1998). Within the local communities of practice, judgements are negotiated and made meaningful by and for members of that community. Moving forward we are interested in extending from the formal adaptation process described here to enquiries of how school teachers (the ultimate users of the TESSA OERs) make adaptations to the TESSA OER as they use them in practice. We are currently engaged in close working with student teachers during practicum to support capturing of their use of the OER and their associated practitioner rationale for any such changes and subsequent classroom experiences. This work is being undertaken with TESSA partner institutions in Ghana. Through analysis of the forms of the OER in use we hope to develop the reflexive cycle of TESSA OER adaptation, sharing and further use using the TESSA Share dimension on the TESSA webspace and to inform current and future large scale adaptations of the entire TESSA OER resource bank - such a process is underway in Togo. As yet we have few examples of sharing back improved versions of the TESSA OERs, although we know from visits to schools across the network, that many such adaptations are being explored but very frequently they are not recorded in any digital form (from our work in TESSA we would want to emphasise that the process of adaptation of OER can take many forms and should not be restricted to digital working although this is essential for fully realising the potential for sharing). Such experience suggests that the vision of increased quality and improved efficiency which could result from building relationships with others, collective development and improvement has yet to become part of practice. The TESSA OER process has been grounded in the use of templates, building on our work with templates in previous projects such as TeachandLearn.net. Use of templates enables the wide sharing of good practice in design of pedagogically rich learning episodes, facilitates consistency of the learner experience and avoids incorporation of large quantities of additional material. However our previous activity harnessed templates purely for content development and no subsequent adaptation of the materials, whether formal or informal, tacit or explicit, was investigated. We suggest that the issue of template format and use with OERs is an area for further study - would educators benefit from a selection of templates? How feasible would it be to encourage educators to reflect on their teaching to select a template which best suits their teaching context? OER content could then be deployed in different templates according to various criteria, such as purpose, time available and learner characteristics. Other commentators have suggested that there are three main challenges associated with OER use: lack of awareness of copyright issues, quality assurance and sustainability (Hylen, 2008). Conole and Weller (2008) suggest that, in addition, part of the lack of uptake is linked to the design of the OERs; they propose a toolbox of support for design. We find this convincing but would wish to add that considerably greater attention needs to be paid to the processes of adaptation of the OERs - supporting colleagues in reflecting and modifying the selection of examples and tasks to ensure that they recognise the wider social and cultural context for learning and their learners' experiences and opportunities. We are interested in exploring how we can support local communities of practice in capacity building of OERs; empowering teachers and lecturers to move beyond merely adopting OERs from external producers to developing their agency to make judgements about modifications appropriate to their own context. With thanks to Jessica Auman, the TESSA intern, for her assistance during the data collection stage of this study. Adekola, O. A. (2007). Language, literacy, and learning in primary schools: Implications for teacher development programs in Nigeria, Washington, DC: World Bank. Atkins, D. E., Brown, J. E., & Hammond, A. L. (2007). A review of the open educational resources (OER) Movement: Achievement, challenges and new opportunities, Report to the William and Flora Hewlett Foundation. Banks, F., Leach, J., Moon, B. (1999). 'New Understandings of Teachers' Pedagogic Knowledge', in J, Leach and B, Moon (eds) Learners and Pedagogy, London: Paul Chapman Publishing in association with the Open University Press. Bruner J. (1996). The Culture of Education, Cambridge, Mass: HarvardUniversity Press. Buckler, A. (2011). ' Reconsidering the evidence base, considering the rural: Aiming for a better understanding of the education and training needs of Sub-Saharan African teachers' , in International Journal of Educational Development , 31(3): 254-250. Carey, T. & Hanley, G.L. (2008). 'Extending the Impact of Open Education Resources through Alignment with Pedagogical Content Knowledge and Institutional Strategy: Lessons Learned from the MERLOT Community Experience', in T. Iiyoshi & M.S. Vijay Kumar (eds)	Opening up Education through open technology, open content and open knowledge, USA: The Carnegie Foundation for the Advancement of Teaching, Massachusetts Institute of Technology. Casserly, C. M. & Smith, M. S. (2008). 'Revolutionizing Education through Innovations: Can Openness Transform Teaching and Learning'. in T. Iiyoshi & M.S. Vijay Kumar (eds) Opening up Education through open technology, open content and open knowledge, USA: The Carnegie Foundation for the Advancement of Teaching, Massachusetts Institute of Technology. Dembélé, M. & Lefoke, P. (2007). 'Pedagogical renewal for quality universal primary education: Overview of trends in Sub-Saharan Africa', in M. Dembélé, J. Oviawe (co-rédacteurs invités) Quality education in Africa : Challenges and prospects. Numéro spécial double de la Revue internationale de l'éducation, 53(5-6): 531-553. Dewey, J. (1966). Democracy and Education, New York: Free Press. Downes, S. (2007). 'Models for sustainable open educational resources', in Interdisciplinary Journal of Knowledge and Learning Objects, 3: 29-44. Harley, D. (2008). 'Why understanding the Use and Users of Open Education Matters', in T. Iiyoshi & M.S. Vijay Kumar (eds) Opening up Education through open technology, open content and open knowledge, USA: The Carnegie Foundation for the Advancement of Teaching, Massachusetts Institute of Technology. Hylen, J. (2008). Why give knowledge away for free? The case for open educational resources. Open Source Business Resource: Education. Hutchinson, S., & Wolfenden, F. (2006). 'A new paradigm for teacher education: supported, open teaching and learning at the Open University', in European Educational Research Association Annual Conference, 13-16 September, Geneva. Kanu, Y. (2005). 'Tensions and dilemmas of cross-cultural transfer of knowledge: post-structural/postcolonial reflections on an innovative teacher education in Pakistan', in International Journal of Educational Development, 25: 493-513. Lave, J. & Wenger, E. (1991). Situated Learning: legitimate peripheral participation. Cambridge: CambridgeUniversity Press. Leach, J., & Moon, B. (2008). The Power of Pedagogy, London, UK: Sage. Lewin, K. (1999). Counting the Cost of Teacher Education: Cost and Quality Issues. Multi-Site Teacher Education Research (MUSTER) Project, Discussion Paper No.1. Lewin, K. & Stuart, J. (2003). 'Insights into the policy and practice of teacher education in low income countries', in Multi-Site Teacher Education Research (MUSTER) Project, Special Issue, British Educational Research Journal, 29(5): 691-707. Moon,B. (2007). 'School based teacher development in Sub-Saharan Africa: Building a new research agenda', in Curriculum Journal 18(3): 355-371. Murphy, P. (2008). 'Defining Pedagogy', in K. Hall, , P. Murphy & J .Soler (eds) Pedagogy and Practice: Culture and Identities, UK: Sage/ The Open University. OCLOS (2007) Open Educational Practices and Resources: OLCOS Roadmap 2012. SAIDE, (2009). Developing and using quality learning resources in an Open Educational Resources environment: The SAIDE ACE Maths project T. Welch & I. Sapire, SAIDE. Wenger, E. (1998). Communities of Practice: Learning, Meaning and Identity, Cambridge, UK: CambridgeUniversity Press. Wiley, D. (2007). On the Sustainability of Open Educational Resource Initiatives in Higher Education, Paper commissioned by the OECD's Centre for Educational Research and Innovation (CERI) for the project on Open Educational Resources. For example at the Open University of Tanzania assessment in the Diploma in Primary Teaching is moving to include a portfolio and the University of Egerton B.Ed includes a project (designing a teaching / learning material) drawing on TESSA activities. In the Banks, Leach and Moon model of teachers' professional knowledge, personal construct lies at the heart of the dynamic interchange of subject knowledge, school knowledge and pedagogic knowledge.